White this, white that. We see white everywhere, and for good reason. This theme has been around for quite sometime, and it seems it is still standing the test of time. We like to stay on top of what our clients are always leaning more towards and the goals they want to achieve in their homes. At WBH, we offer six variations of white fabric, not including those that are considered off-white, like our Bespoke Pearl for example, which is bit more on the creamier side. These fabrics are flexible in terms of what they can be used for, roman shades, drapes, and some even pillows. We will walk through each white fabric, and what they are best used for and the look each will create. The title speaks for itself. This fabric is sheer or transparent, which means the most light will pass through this. This fabric will come without lining, because what’s the point of adding lining to a sheer fabric, when you can use a solid fabric instead? This will create a very soft, and airy feel to your room. This option is great to use for low maintenance and low wrinkle, since the composition is polyester. When using this sheer for drapes, the wider width, the better. With it’s delicate and thin nature, you want your drapes to look full. This beautiful fabric is definitely a favorite. With a unique and mesh-like texture, Evelyn will create a very organic vibe. We love to use this fabric for roman shades in combination with a sheer lining to add a little extra volume to those oh so perfect folds. This fabric can also be used for drapes, (just e-mail us for a quote). This is our #1 seller when it comes to drapes. Very soft, and on the thicker side, our Icing fabric is a staple in allot of our projects. The reason we call this a solid is because it is not as see-through as our sheers we mentioned earlier. This will make for full, and low maintenance drapes due to it’s thickness and composition. These are ideal if you don’t want to steam anything after your install. They will wrinkle minimally during their shipment to your home, which is a key factor in why they are so popular, (at least that’s what we think). You can see we have a bit of a trend here. A key to a good quality and low wrinkle fabric is polyester. More polyester = less wrinkles. This fabric is one of our newer additions to our website. 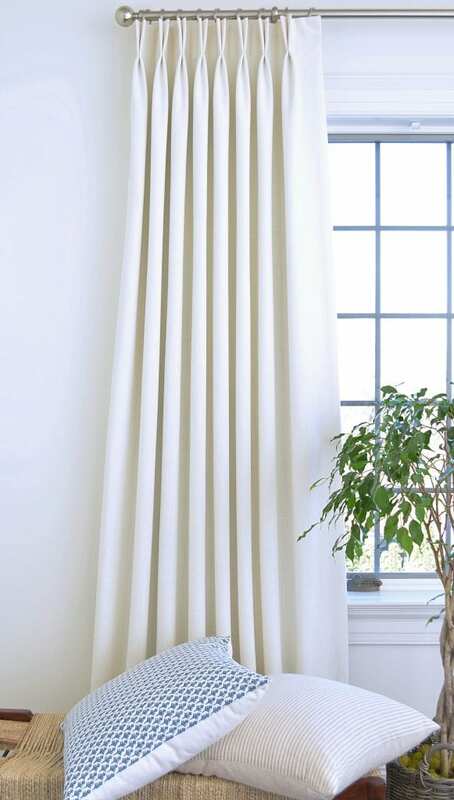 Also unlined, this drape is made with buckram (buckram heading is a strip of white or translucent stiffener that helps add a more defined shape to a drapery header) for a very soft, and organic feel/look. Although this fabric is also white, there is a noticeable characteristic that separates this fabric from the rest. We mentioned composition is key, and this remains true. Malbec has a tendency to wrinkle more, thus creating a more casual and organic feel to this fabric. Don’t get us wrong, this drape can still be formal, but it is not as heavy and soft as afore mentioned Icing. It is a lighter fabric and will lay a bit differently than the rest. This version of Malbec is a very crisp white. This is the same as our Malbec Powder, just slight variation in color. Powder is a more crisp white, while Oyster is a bit more off-white, which surprisingly can create a world of difference (hence why we offer fabric samples). And don’t forget, Icing and Sheer Crisp White have amazing markdown prices!